KTM production for the next model year would start at the earliest in late August (08) but usually in early September (09) just after their summer holiday factory shutdown. So if the frame number at the steering head reads 8208######, 8209#####, 8210#####, 8211#####, 8212#####, 8301##### these would all be 1983 models meaning they were built from August of 1982 to January 1983 (and so on) as 1983 model year KTM's. This is true for the mono shockers manufactured from 1982 and up. For stereo shockers (up to 1982) they used an other system: In the early days they stamped only the last digit of the year in to the frame: 9=1979, 0=1980, 1= 1981. The two following digits is the production month: 05=May. So if your frame number starts with 002 ######: It's built in February 1980. The motor number would also reflect the year of assembly (not the model year sometimes) as 2*563*######, or 3*563*###### this would indicate that the year (2=1982, 3=1983) and the Engine Typ (563=495ccm, 560=420ccm, 561=350ccm and 562=390ccm) of the motor you have. This format is still used on current engine production coding. But beware: only because you have an engine typ 563, it does not mean that you realy have a 495. Because all cylinders without reedvalve from the engine typ 56# (= 350ccm to 495ccm) are interchangable! Since the engine number doesn't reflect, in every case the size of your engine, it's best to check the spare part number molded on the top right fin of the cylinder head. In general: If it's a dual plug head, it's in either case a 495! If it has a reed valve intake, it's as well always a 495, manufactured from 1982 to 1984. Note: onto a reed valve based lower end it's not possible to install a cylinder without reed valve. 563.30.006.000: 495ccm, High compression (14:1), dual plug head, from 1981 to 1982, and on US version in 83. 563.30.006.200: 495ccm, Low compression (11:1), from 1983 to 1984. 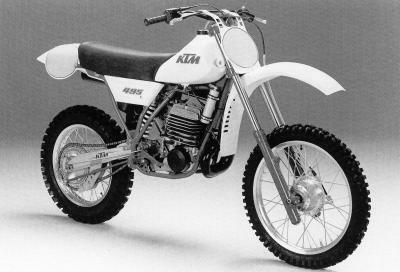 1980: A new GS 420ccm, GS 390ccm and GS 350ccm based on the engine type 560 were introduced that year. 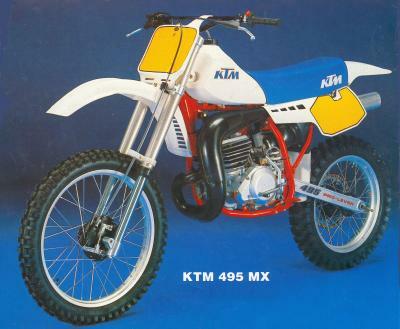 1981: A new MC 495ccm without reeds and other gimmicks, and a water cooled MX 125 was introduced this year. 1982: New MC 495ccm with reed valve. Introduction of the mono shock for all MC-models. MC 250 is still air cooled. All the GS-models are still equiped with stereo shocks. 1983: Introduction of the front disc brake for the 495. MC 250 is water cooled now and has double leading drum brakes. For the GS-models: 350 and 390 were skipped, only GS 420, now with mono shock, is available. 1984: The last air cooled 495, known for low power output but a very strong torque at low rpm. An easy to ride bike equipped with WP-UpSideDown forks and light, powerful double leading drum brakes. This was the first model year with the new 420 engine (type 560) and frame/suspension. Everything was new compared to the MC 400/78: An new Chrommolybdene steel frame. New conical hubs with drum brakes both front and rear. Hardned alloy swing arm with needle bearings. The rear suspension was a twin configuration with Bilstein-shocks. The front fork was a ø38mm conventional (ø35mm GS version) Marzocchi unit. The side panels with number plates and the rear fender are typical for the MC 420/79-80. There weren't much changes during these two years. The 1981 model is known to be the fastest of them all. It didn't have a reed valve intake. A very long intake manifold and a small exhaust volume contributing to the overall power output at high rpm. Due to this setup the engine was capable to overrev without loosing to much power. Beside it was the lightest 495 ever made, this was the reason why this bike could reach this enormous top speed. It was not the strongest 495. 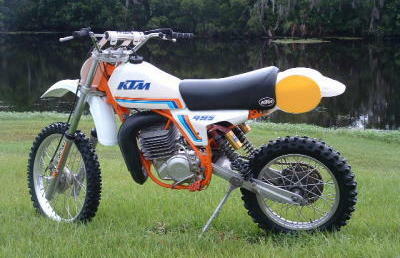 One year later KTM added some ponies, but at lower rpm. The head had the twin spark plug. The idea was to get a more complete combustion despite the huge volume. The compression was 14:1.The front fork was a ø38mm conventional Marzocchi unit. 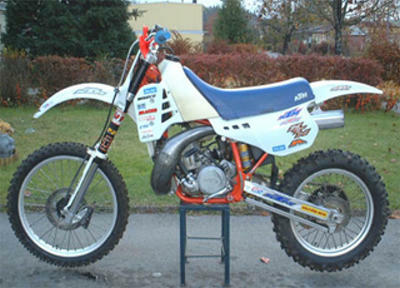 The rear shocks was Öhlins or WP piggybacks except the US model that was equipped with FOX air shocks. It had the typical rear fender with number plates. Drum brakes both front and rear. This bike is very rare and the twin shock setup makes it qualified for certain vintage classes and therefore it holds a high value. 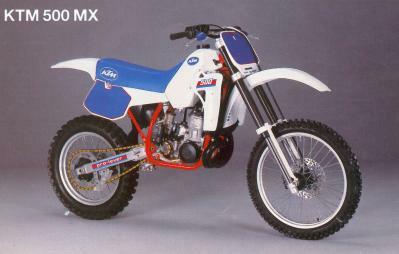 The 1982 model had the first rear mono shock configuration named Pro-Lever. The bike had a WP piggyback or Fox twin clicker unit. A ø40mm Marzocchis up front with aluminium sliders (81 mod. magnesium). The engine got a reed valve intake and the overall power output was a bit higher but with a more manageable powerband. It still had the twin plug head, compression 14:1. It might be the stronges 495 ever made. The expansion volume is the same as on the 495/81. 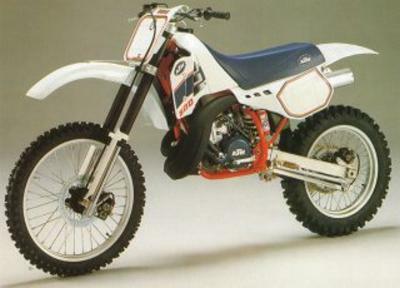 The white nightmare was called the best open class bike in 1982. The power, suspension, stability was popular among riders. It still was the undisputed horsepower king. Rear shock Pro-Lever WP or Fox multi adj. The 1983 model got some updates too. The fork was the ø42mm Marzocchi tubes. The disk brake by Brembo was all new and the seat was now drawn up on the tank. They called it "safety seat". The bulky Magura levers were gone, but it remained the heaviest 495 ever made. 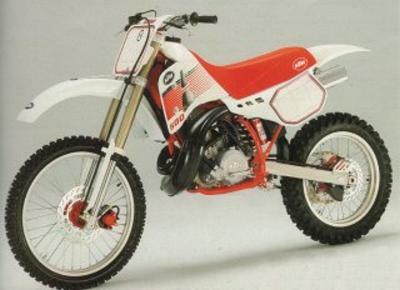 In 1983 the engine was originaly designed with the low compression, single spark plug head. KTM changed the piston (2 rings) and with that the porting slightly and increased the exhaust volume a bit. The US market and most rider over the world changed the head back to the dual plug high compression version for higher power output. Even in 1984 there where heavy updates. All new was the WP USD fork. 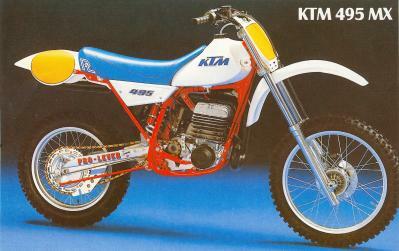 The disk brake was gone and KTM had a twin leading shoe drum brake. The brake is said to be equal to Yamaha's 465/490 and there is also said that the Yamaha brake shoes fit right on. The sidepanels now held the number plates and the rear fender got a slimmer and a more modern look. There was a single plug head again and the compression was lowered from 14:1 to 11:1. The power was at least 5 HP's down from earlier. There was also a new more rigid swingarm and again an increase of the exhaust volume. At that time a high compression single sparkplug head appeared on the market. But still with this high compression head, the power delivery is very smooth, and not comparable to the brute force of the 81 or 82. 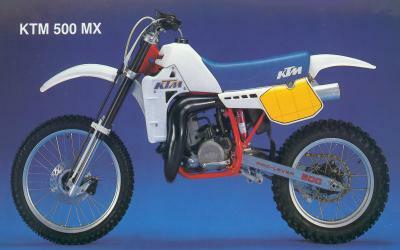 The MX model had a 4 speed gearbox and the MXC model a 5 speed. The bike was appreciated in reviews for it's magnificent fork, great handling and speed. The problem was an underdamped rear shock. The radiator shrouds pictured below, unfortunately never came in production. Not many modifications this year: A new swing arm, modified linkage and shock. A rear disc brake replaced the drum brake, front disc assembly modifided. New exhaust for better ground clearance. Fork with "Hydro-Stop" and better internal sealing of the damper rod and piston. All new plastic, modified radiators and an new routed "Low-Boy-Pipe". Very good 4-piston caliper front and rear! Better water pump and new crank shaft (stroke still 78mm). Bigger cluch and stronger cylinder base mounts. New Dell'Orto carb. Completely redesigned bike: Only plastic keeps the old look. New cylinder and crank with new conecting rod. Stroke increased to 80mm. Displacement is now 497.5ccm. Shock with new compression valve and new setting. New "Multi Adjuster Front Fork" with external comp./reb. adjustement. The production carried into the early 90's. 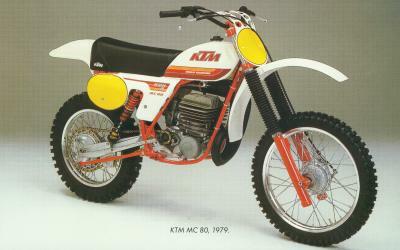 There came a 550 version designed for desert racing. The engine itself lived on as a stroked and bored powerplant in sidecar motocross.